Who cares about OH&S when there are fish and chips to be cooked! I purchased Overcooked! during the 2017 Steam Summer Sale. Like many other recent additions to my Steam library, I was on the lookout for games that I could play on the Steam Link with my family and a game that was built from the ground-up to be a couch co-op title seemed like the perfect choice. The game has cute, appealing graphics and even gives you the option to play as anthropomorphic animals if you so desire. Combine the cute graphics with non-violent gameplay (well, besides the occasional accidental shove) and you've got yourself a game the whole family can play. You get to play on a whole bunch of crazy levels, such as one where you have to jump between three trucks driving on a highway in order to cook some meals or another where you have to chase a possessed stove as it floats around a haunted house; there are even levels set in outer space! The game supports local co-op. In fact, it's essentially the only mode this game supports and the reason for this game even existing. The game works on the Steam Link along with wireless Logitech F710s as controllers. In Overcooked! you have to accumulate a certain number of points in order to be awarded stars which are used to unlock more levels. The game is generally easier when you have more players and as a result, it seems that the points threshold required to unlock stars increases as you add more players. Overall, this is a good move since it means you won't feel short-changed by the fact you have no friends and it means the game is still challenging even with a full team of four. The game has 12 Steam Achievements you can earn and 8 Steam Trading Cards to collect. Now, one of the primary reasons I got this game was for the fact it's a family friendly couch co-op game, and Overcooked! succeeds in this regard. However, is it a game that kids can easily pick up? Yes and no. For older kids, I think this game won't be a problem, however for younger ones, the chaotic nature of the game might be a bit too much for them, especially on later levels. Consequently, we reached a brick wall in terms of progress since while you can probably saunter your way through the first few levels without much difficulty and grab one or two stars, you'll probably need help from adults or older kids in order to unlock levels later in the game. 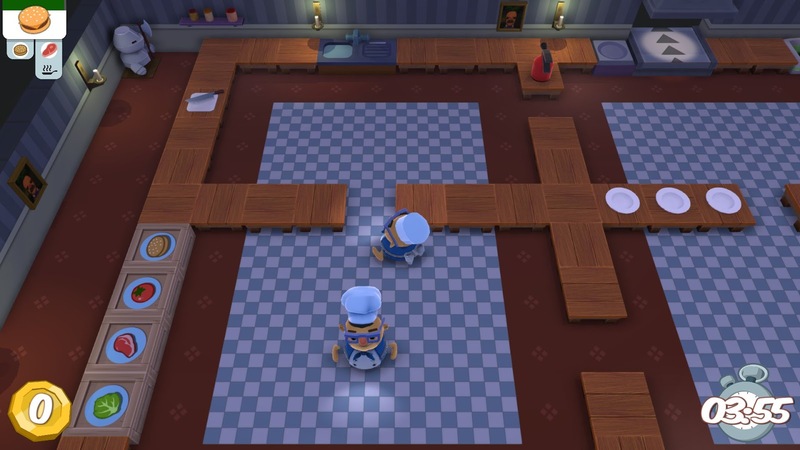 While on one hand I can appreciate a game that really benefits from having friends and family co-operate towards a common goal, on particular levels of Overcooked! it's quite obvious you'd benefit from having a full complement of four players: this is especially apparent on one of the haunted house levels where the room is split into four sections and at some points you can be cut off from the other sections if you're not vigilant. However, if you have four players on this level, you'd have a cook in each of the sections and you wouldn't even need to worry about being locked out since each section is already occupied. While this isn't a big issue for me, it is with a lot of other players. 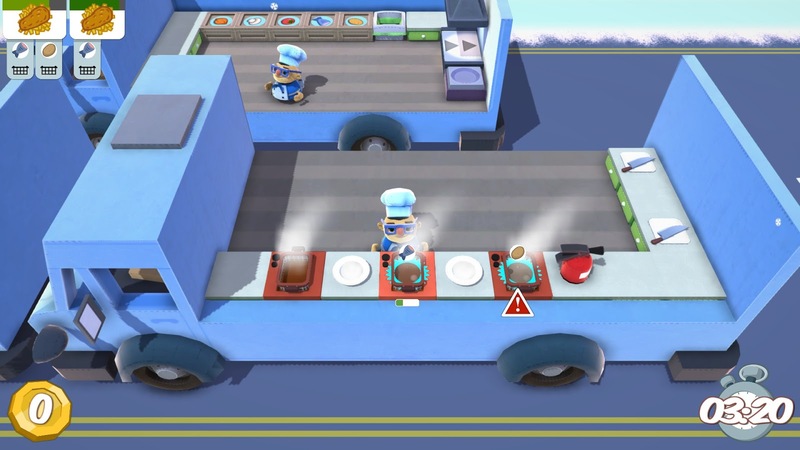 Thankfully, their prayers have been answered as the game's sequel, Overcooked! 2, promises to support not only local multiplayer but online multiplayer as well. Overcooked! 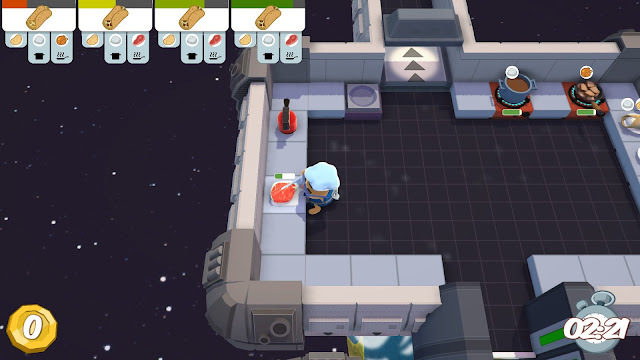 is a must-have for those looking for quality, family friendly, couch co-op titles: if you ever wanted to have a go at running a restaurant in ridiculous circumstances and exotic locations, this is the game for you. Just make sure you're playing it with co-operative older kids or adults, otherwise it will be a recipe for disaster (mind the pun). Is the game worth $16.99 USD? : Yes. There are many hours of fun to be had with this game if you can find some friends and family to play it with.